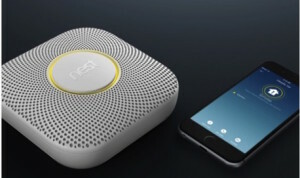 Nest makes smoke detectors with enhanced features that you can easily disable for false alarms from cooking. Who can forget the Oakland Hills fire of 1991 that filled the sky with smoke and turned the hills into an inferno, destroying countless homes, priceless possessions and memories of happier times. Late summer and early fall is when the wind picks up and increases fire danger. This year it’s even worse–we’re facing our fourth year of serious drought, and homes in wooded areas are especially vulnerable. People become frustrated by smoke detectors. Is this you? “I took a shower and it went off; I cooked and it goes off; failing batteries woke me up in the middle of the night.” Frustrated, you ripped out the batteries. You may think that if there’s a fire you’ll see or smell it in plenty of time to wake up, call the fire department, get your family and belongings out, right? Think about this. Every year there are 2,650 deaths, 12,890 injuries, and $7.1 billion in direct property damage from house fires. One more stat: A National Fire Protection Agency study found that of smoke alarms that failed to activate during home fires, a whopping 73% of them had dead, missing, or disconnected batteries. Don’t take chances with the lives of your loved ones. If you’re weary of these accidental triggers, it may be time for an update. The new smoke detector models have a hush feature—you can easily push a button to manually turn off the alarm that is cooking-activated. They also have built-in, tamper-proof batteries to ensure functionality. Nest has some elegant new solutions with gradients of alarm. To disable a false alarm, rather than balancing precariously on a chair, simply wave your hand three times in the air. Forget loud beeps, this products talks to you, telling you what is wrong. Nest Protect communicates with you, in varying degrees of urgency. In the center of the device is a color-coded ring that glows if there is a smoke or CO emergency; otherwise, it will glow green or yellow for a warning. At night, this doubles as a path light. This product is wifi-enabled and will synch with your other devices so you will receive updates. Protecting your family with a smoke alarm is important, but it may also be time to take a look at your electrical components—a common cause of home fires. With the increased use of electrical devices today, it’s not uncommon for circuits to become overloaded. Take a minute and think about this. If you have five family members and each has a cellphone, tablet and laptop, that could be more than your home’s electrical system can handle—especially if yours is an older home, as is the case in many of Oakland’s neighborhoods. If you’re frequently blowing fuses or tripping circuit breakers, if you notice outlets and switches that are hot to the touch, it’s time to call an electrician—these are all indicators of unsafe wiring conditions, which could result in fire; upgrading your wiring is an important safety precaution. If you’re concerned about your electrical system’s ability to handle your current needs, call Roberts Electric for an assessment @ 510.834.6161. Let’s also talk about smoke alarms—stay safe during fire season.